UnReviews: Telling you what you think about your consumer preferences for you. Good morrow, fair gents and ladies! 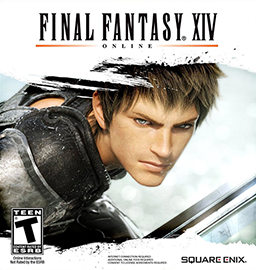 I am IloveLightnin666, a humble adventurer who has set foot on the lands of Eorzea, the realm of Final Fantasy XIV, which is the latest addition to Square Enix's flagship Final Fantasy series, and is the second MMORPG of the series (the first being Final Fantasy XI). Though my adventure went off to a rocking start, my experience in Eorzea has become rather cumbersome of late, and I realize that now is probably not the best time to continue with this game. Let me tell you why. As I have already told you people, Final Fantasy XIV is an MMORPG. That is, a game where you're thrown into an open, ever changing world along with countless other players who bought the game. By buying of course, I mean signing on to a monthly subscription that makes you shell out $5 of your monthly salary if you want to keep playing after the 30 day "free trial". Obviously, MMORPGs can only keep raking in the moolah if players are interested in playing them over long periods of time. 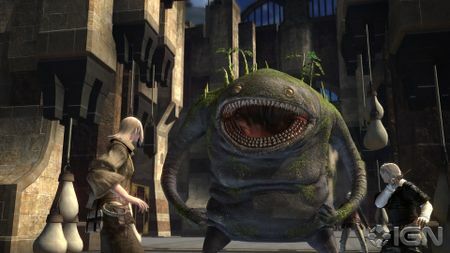 It is indeed what separates good-to-mediocre RPGs from the truly awesome ones. While the gameplay of Final Fantasy XIV is pretty remarkable in certain aspects, it fails to hold your interest beyond a point. First, let me tell you what is remarkable about this game. For starters, you begin the game with an uber-awesome opening cut-scene, and an equally engaging story-driven mission which gets you hooked. Such story-driven missions give you a sense of purpose for all the stuff you'll be doing throughout the game. The problem is, these missions are far too scattered, meaning you'll be spending most of your time in the game without them. Once your starting mission's over, you're essentially left to your own devices, and it's up to you to decide where to go from there. As with most RPGs, this game has a class-system too, and a superb one at that. Though you have to choose your character class at the beginning of the game, you can change it just by buying equipment that belongs to another class. The real beauty of the system lies in how you can actually mix-and-match the different abilities of each class until you figure out which combination suits you best. Or, you could simply switch your class whenever you find it convenient. This type of freedom also helps a lot when you're working as part of a group, for who knows when they may require a Marauder (axe-warrior), a Conjurer (magic), or a healer? The real beauty of the class system lies in how you can mix-and-match the different abilities of each class until you figure out what suits you best. Apart from that, there are also various resource-gathering skills, such as crafting and harvesting. They will play an integral role in helping you advance in the game. For starters, the best way to improve your armor would be to either buy it, or craft it. However, crafting it has a special advantage, as it racks up points for a universal pool of experience known as the 'physical level'. So, while you'll always be working at bumping up your class rank, your physical level will also increase, freeing up points that can be used to improve upon your attack, defense and magical abilities. The mechanism of crafting is well-designed as a high-risk system which requires a lot of luck and effort to come up with something good. If you do succeed, the feeling is sweet. Also, it encourages a lot of player-to-player interaction, as some classes can only build up components that others must fashion into a whole. In such cases, you'll need the help of either a fellow special crafter, or one of your friends who belongs to the appropriate class. 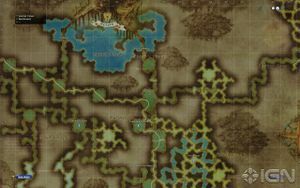 The overworld map does little to help you navigate the enormous realm of Eorzea. The problem with this system is that it's not well explained in the game at all. Indeed, it's going to take hours of searching fan-sites and databases if you want to get familiar with the nuts and bolts of how these procedures work. The lack of any helpful tutorial within the game makes it a bane for casual gamers. The problem with the game is that nothing is well-explained in it. The lack of any helpful tutorial makes it a bane for casual gamers. Another major problem with the game is its atrocious marketing system. Simple tasks like buying and selling stuff have become ridiculously convoluted, thanks to an appalling menu system which requires you to open up a main menu, and browse through countless sub-menus if you want to get anything done. As if that wasn't bad enough, the developers clearly haven't given enough thought as to how player-to-player trading should function. 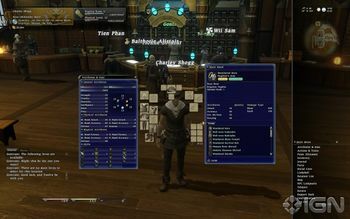 As of now, the game requires you to hire a retainer, and give him items so that he can sell them in an instanced market area. The idea is that other players will enter the market area, find your retainer, and purchase your items from him. Unfortunately, this results in an unholy mess of a market area, where there are countless retainers selling who-knows-what, and you have to walk up to every retainer, and maneuver through the mess of a menu system again and again until you find what you're looking for. Such major flaws in game design make for a very cumbersome experience, which is totally unacceptable given how integral buying and selling stuff is to this game. What did I tell you about the menu system? The quests of the game, known as levequests, also get very tedious and repetitive after a point. They essentially involve you going up to one of the various camps scattered outside the cities, and finding a giant crystal known as an Aetheryte, where your quest will be initiated. You're then put on a timer until you've accomplished the objectives of the quest. These 'objectives' are generally "killing" and "collecting" tasks that are given a very thin veneer of story. Though fun to do at first, these quests get increasingly repetitive and cumbersome as you continue doing them. Also, there are only a few quests you can actually perform at a time, which means you either have to wait for more of them to unlock, or you have to interact with others and help them with their quests. Given how each quest becomes to feel exactly the same after a point, and how you have to churn through the same handful of quests for hours in order to unlock other levequest camps, these levequests eventually degenerate into testing your toleration of boredom. So does the generic grinding in this game, which also just keeps getting more and more time-consuming as the game progresses. Another huge issue with this game is its performance. 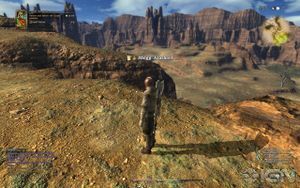 The game lags a lot, and there are several frame-rate issues which tend to intrude on your exploring and combat, particularly in outdoor locations. Though they're not bad enough to render the game unplayable, they can be thoroughly irritating when piled on top of the crappy menu system, the boring quests, or the grinding that's beginning to make you sick. The real shame in this is that the game actually looks drop-dead gorgeous when at optimum graphical settings. Your entire world, from the starting cities of U'dah to the vast grassy terrain of Limsa Lominsa, is impeccably detailed, and you can see the amount of effort the developers have put in creating such a beautiful world. The game is beautiful, and impeccably detailed. So is all your armor and weaponry, which gives you additional motivation to upgrade your equipment, as you'll not only be getting more powerful weapons and armor, but also better looking weapons and armor. Even the animations are very detailed and realistic, making most of the NPC and player movements totally believable, whether you're combating dodos and wolves, or crafting a new platebody. Sadly, even the brilliant graphics, and the remarkable sound effects and music, cannot make up for the crappy menu system, the performance issues, and the increasingly tedious and repetitive gameplay. On the whole, Final Fantasy XIV is a beautiful game with some power-packed features that sadly gets botched by some major design flaws, such as the crappy interface and menu system, a storyline that fails to hold your attention thanks to how scattered all the missions are, and gameplay which eventually loses its sense of purpose as everything becomes repetitive and time-consuming. Add to that performance issues, such as an irritating frame-rate and a lagging interface, and the lack of any helpful in-game guidance, and you've got a game that is simply too much of a drag to be trying out right now. My account on FFXIV is currently suspended, and it's going to stay that way until Square Enix makes enough changes to alleviate all the boredom and tedium that has accompanied this disappointing installment. Until we meet again, Eorzea. This subject is 2 out of 5 stars! This page was last edited on 31 December 2013, at 13:25.